A = Excellent: Outstanding work; complete, accurate, well written submission, demonstrating comprehension of material covered by the course. B = Good: above average work in respect to the afore-mentioned factors. C = Satisfactory: acceptable work such as may be expected from students of normal ability. D = Below Average: a standard of work below that expected from students of normal ability. I = Incomplete: elements of the required course submissions are lacking. Students will have 30 days from receipt of an ‘Incomplete’ grade to submit missing course work at no charge. Thereafter a charge of $25 is assessed. The grade automatically becomes ‘F’ unless work is submitted within 60 days. F = Fail: requirements were not satisfactorily fulfilled in a credit course. W = Withdrawal: an official withdrawal from class. Students receiving a grade less than they consider themselves capable of achieving may resubmit their reworked course work. This must be submitted within 30 days of the grade being assigned and must be accompanied by a $25 resubmission fee. 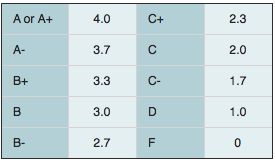 Grades for work for the same course will be averaged, and the final grade entered in the student’s record. This may be done only once per course. Whitefield College expects students to maintain the highest standards of academic integrity. All forms of cheating and plagiarism are considered to be serious ethical failures, and students will receive a failing grade for any proven instances discovered. We reserve the right to submit papers to organizations that specialize in the verification of academic integrity. Courses completed satisfactorily are applied toward graduation requirements on the basis of credit hours completed. They are evaluated in terms of letter grades which are translated into grade point averages. Satisfactorily completed a minimum of 121 credit hours of study, at a GPA of least a 2.00. Received at least a “C” in all courses required in their field of emphasis. Completed at least 12 credit hours of Bible courses from Whitefield College. Settled all financial accounts with Whitefield College. Satisfactorily completed 61 credit hours of study, at a GPA of least a 2.00. Received at least a “C” in all courses. Fully settled all financial accounts with Whitefield College.